Occasionally, Intuit needs to obtain customer's company files so that we can quickly gain information to solve errors faster. Follow the steps below to upload or download a QuickBooks Desktop company file to or from Intuit. You will be directed to or given a link/URL to upload your data file. Click to expand detailed steps to upload your file to Intuit. NOTE: When an unsupported browser is used, a warning message appears. Enter the Case, Email, and PIN. Accept the Terms of service and click Sign In. Click the Browse button to select a file and click Upload to start. Note:You can only upload one file at a time. Click OK to the message stating the file has been uploaded. Note: Unless advised by Intuit, do not input any information into the file until the repaired file is returned to you. 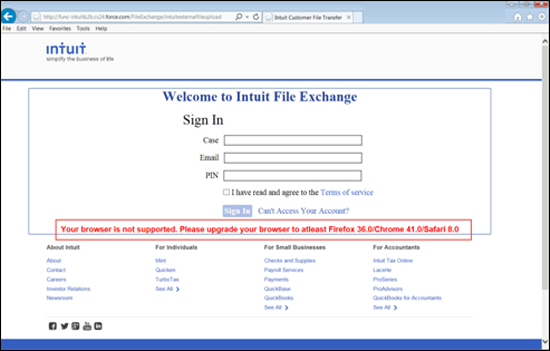 Sign in to the Intuit File Exchange website. Enter your case number, e-mail address and your PIN. Important: The PIN is case sensitive. If you have forgotten or misplaced your PIN, please contact us and we will provide you with a new PIN. Locate your file (it may be renamed FIXED) and click the Cloud icon to start the download. Browse to the location where you want to save your file. If available, download the Readme.doc file. This file contains information you will need to begin using your repaired file. Save both your data file and the Readme.doc in the location where you want the file stored to avoid data corruption or any unexpected results. If you are accessing the file over a network or on a server, restore the file locally first before saving it in the location where it is hosted. Your data file may have the extension of .qbb, denoting a backup company file. If so, convert the downloaded backup company file to a full company file. Your data file may also have the extention .qbm, denoting a portable company file. If so, see how to restore a portable company file.